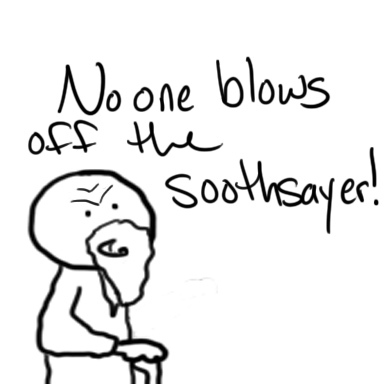 Hearing a Soothsayer calling it "The Ides" certainly wouldn't have sent any shivers down Caesar's spine - you know, outside of being told to beware it because of your impending death and all - for all intents and purposes calling out the Ides of April would have gotten the Soothsayer the same reaction. Geez! I got the wrong date again! So there I was this morning eating a lovely bowl of porridge (read that as Oatmeal) patting myself on the back for eating whole grains for breakfast instead of a chick fil a biscuit and using apples and raisins to sweeten those grains instead of sugar, when I glanced at the wall calendar. March 4th. Oh man! The Ides of March was yesterday on the 3rd. I missed it again! Or wait….are the Ides on the 5th? I can never remember what day in March the Ides actually fall on. It doesn’t matter, it really doesn’t. In fact, my whole reason for wanting to remember the date (for the last two years) was so that I could use it on my Facebook status. Try to refrain from rolling your eyes. Having “Beware the Ides of March” as my status might signify to all who saw it that I am cultured, clever and well read. That you may find on my bookshelf the works of Shakespeare (pronounced here real snooty-like and with a hand flourish: Shake-sp’yah!) and probably not 50 Shades of Gray. That I might enjoy eating sushi and not those God awful looking Fish McBites from McDonald’s. They may think to themselves ” Perhaps I should post this inspiring quote by Mark Twain on her wall instead of the picture of the fuzzy little kitten spewing obscenities and flipping the bird.” (Cat’s have middle fingers? Who knew?). I have a friend who laughs at my annoyance over the lack of interest when I would post what I feel are discussion worthy topics. I might draw two likes and her one sympathy comment. But that comment over on such and such’s wall about what happened at the bar this past weekend was liked 234 times and got 37 comments in 4 minutes. My laughing friend being one of the likers. Et Tu, Friend? Yes – I am slightly bitter. But I digress…. I did some quick researching and found “The Ides” fall on the 15th of the month. I did some additional Googling research and found that outside of Shakespeare’s play Julius Caesar, the date means nothing at all. The Ides is just a fancy way of saying the 15th. Hearing a Soothsayer calling it “The Ides” certainly wouldn’t have sent any shivers down Caesar’s spine – you know, outside of being told to beware it because of your impending death and all – for all intents and purposes calling out the Ides of April would have gotten the Soothsayer the same reaction. Ignored. 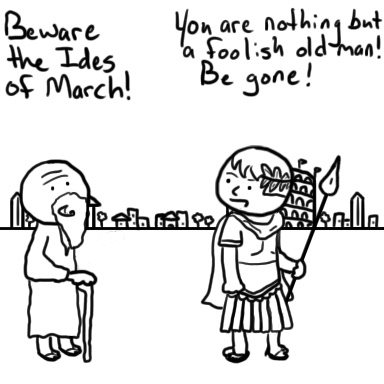 So should I again forget to warn my FB friends about the Ides of March this year, I won’t worry about it. Another Ides will be along in 29 days or so. You can Beware it then.